Swimming is a complex sport requiring special physical qualities for the land bipeds we are. Indeed, contrary to many other sports, the arms do the main part of the movement (at least 70% of the power). The biggest muscles of our body (thighs) are very little used. Man is not an aquatic animal, it is much harder to learn swimming than running. In particular, the biggest difficulty in the practice of swimming is breathing that needs to be synchronized with the movement of the limbs. We must learn to breath in enough oxygen when the head is above water to allow an efficient pull-push. The role of a coach takes on its meaning, because an external person is viewing and analyzing much better the technique used. Like other aerobic sports, you have to consider separately the two notions of power and endurance to progress (Ref.). • the consumed power which depends on the maximum oxygen intake (VO2max). 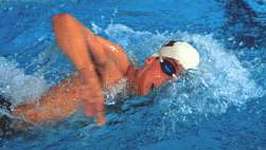 • the produced power which gives the maximum aerobic speed of swim (MASs). These two powers are linked with each other, that defines the yield, but unlike running, this yield fluctuates widely depending on the swimming technique used. As the maximum aerobic power can't be maintained more than 6 to 8 min, you have to practice this maximum duration or by splitting. For example, you can use repetitions of 100m at MASs, but the better is to use a short splitting adapted to the need. Endurance improvement requires not only sufficient swimming distances, but also high intensities. You can use long splitting to improve the percentage of the power on the distance (%MASs).